We're happy to offer a number of downloads for Monticello and the Town of Thompson, Sullivan County, NY, and more will be coming soon! --Records of the Methodist Episcopal Church, Rock Hill, Sullivan County, New York, compiled by Gertrude A. Barber (1929). Gertrude Barber certainly saved many records of small country churches in Sullivan County from loss. This compilation of the records of this small congregation is yet another example of her work. 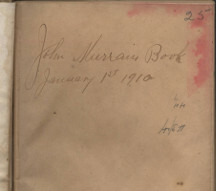 This record includes baptism from 1884 to 1892, and marriages from 1883 to 1893. There is a membership list, perhaps a combination of several such lists, bearing dates of as early as 1867 and as late as 1906, although most dates are in the mid 1880s. 11+ pages, in PDF format. Download now for $3.50. --Records of the Methodist Episcopal Church, Monticello, New York, compiled by Gertrude A. Barber (1929). Of the Sullivan County church records we publish, this is by some margin the largest and most complete, including, for example, a church history – uncommon among these compilations. Baptisms begin in 1861 and continue through 1910. Marriages begin in 1864 and continue through 1906. Mrs. Barber appears to have culled death records from throughout the records and they are listed as they appear. The member list is extensive and includes some information regarding where new members came from and where those leaving went, although this information is far from complete. One woman who removed without letter (a way of letting clergy in a new locale know of church attendance and membership) is annotated “don’t deserve any” – one wonders what her sins might have been! Finally, Mrs. Barber provides an index to these records. From previous experience, we add that her copying skills have been observed to be far superior to her indexing skills, so if an ancestor is missing in the index (or not on a specified page), please don’t take that as indication that the ancestor is not present in the records. We note that very frequently the couple being married did not list Monticello as their home town. This is a possible place to find marriage records that do not appear in the expected town. 89+ pages, in PDF format. Download now for $4.00. --Monticello NY Sesquicentennial (1804 - 1954). The unsung author of this history was one Alice G. Mapes. We do not know what her official role was – whether she was a town or village officer, or whether she was just someone who stepped up to the task of collecting and organizing the very considerable amount of material in this history. Looking back more than half a century later, it is apparent that there were other historians involved, and these were the advertisers and the participants in the sesquicentennial festivities – by their participation, whether personal or financial, they wrote their names and the names of their businesses in the history of Monticello. Especially given the marked changes in Monticello and the rest of Sullivan County during the intervening half century, this document reflects a history that lives today only in books such as these. Things indeed have changed, and perhaps most would conclude that the words of the “Looking Ahead” section represented an optimistic view. 104+pages, PDF format, download now for $5.00. --Gertrude Barber's records of the Rock Ridge Cemetery, located near Monticello in the Town of Thompson. (circa 1930) Essential for anyone researching family history in the central part of Sullivan County, NY. This is a facsimile of Mrs. Barber's original typescript of her collection of the stones in this cemetery. 33+ pages, in PDF format, download. $3.25. --Presbyterian Church, Monticello, New York, Centennial (1909). Paralleling the first century of Sullivan County's existence, and located in the county seat, this history is a useful adjunct to such works as Quinlan's History of Sullivan County, and provides considerable historical information about the community in addition to history of the church itself. It contains a full list of all members from the beginning as well as photographs of many of the clergy and some of the buildings. One leaf was unfortunately missing in the original, containing on one side a photo of the "new" manse, and on the other the beginning of an article largely about music in the church. 130+ pages, PDF format, download for $4.00. --Old St. John’s Cemetery, Monticello, New York, collected by Gertrude Barber (1930) When Mrs. Barber collected this cemetery in 1930, she noted that it was to the rear of what was then the present St. John’s Church Cemetery, and that while the current cemetery was being maintained by that Episcopal congregation, the section she calls the “Old St. John’s Cemetery” and is collected here was not being maintained at all. She notes that this section is “badly neglected” and, in our experience, when a cemetery is neglected for many decades, it deteriorates rapidly. Perhaps we might find that soon after her study was published the cemetery began to be better maintained – or perhaps not. It is also noteworthy that Mrs. Barber notes that the records of the church were destroyed by fire “about twenty years ago” or about 1910. Under these circumstances, her collection of this cemetery is likely of great genealogical value – greater than many cemeteries its age and size. 13+ pages, PDF format, download now for $3.50. --Records of the Bridgeville Circuit of the Methodist Church. The Bridgeville circuit of the Methodist Church included churches at Bridgeville, Thompsonville (records for this one are unfortunately lost), and Rock Hill, as well as Glen Wild, and Mountaindale (both in the Town of Fallsburgh), although over the years the small churches covered appear to have changed. The records (primarily baptisms and marriages, with one membership roll) in this collection begin in the 1880s and end in the 1920s. Note that these records in this download are not included on the Fallsburgh CD-ROM. Collected by Gertrude Barber in 1929. 42+ pages, in PDF format, download now for $3.00. --The Apology Of Monticello High School, Monticello, NY, for June 1930 (Volume 11, Number 4). When we first picked this little magazine up we assumed it was the school literary magazine, filled with pretentious undergraduate writing. We were delighted to find that it actually is a bit of a literary magazine, but it also seems to be a bound issue of the school newspaper, and that it contains some really humorous material as well. (It helps if you find amusing what high school students in 1930 found amusing, but once you get over that hurdle, it is occasionally pretty wicked. The humor also masks what were pretty clearly justified complaints – such as the unflattering description of the Monticello High School gymnasium.) There are also a number of advertisements, all of which reflect the times. The funeral home also advertises their ambulance service, for instance – for those who did not know it, back in the day undertakers typically were also providers of ambulance services. We were interested to note that Lawrence Cooke, who went on to become New York State Justice Lawrence Cooke, at this time was secretary of the Monticello High School Debate Club; the experience obviously served him well. 47 pages, in PDF format. Download now for $2.75. --Sullivan County Court Calendars --We have three of these: the calendar for the July term of 1893, for the June term of 1899, and for the January term of 1904. They are short -- each consisting of a few pages of court rules, followed by the litigation scheduled (parties to the litigation as well as their counsel are named). Interesting ephemera, particularly if you recognize the surname of a litigant! Definitely available soon as a download. --Miscellaneous post cards and other ephemera, including historic topographical maps. Remember that additional material about Monticello and the Town of Thompson is available in Quinlan's History of Sullivan County, and Child's Gazetteer and Business Directory of Sullivan County for 1872-73. Should we be thinking about publishing a CD-ROM of material about Monticello and the Town of Thompson, including all of these items? The possibility has occurred to us. Tell us what you think! If you have an interest in Sullivan County, you'll also be interested in our other Sullivan County publications. to go to our Sullivan County page, or check out Quinlan's History of Sullivan County or Child's Gazetteer of Sullivan County (1872).